Congratulations to Keith Miller, Kath Drainer and Kevin O’Donnell​ who have just won the 50:50 draw for August, September and October respectively. Congratulations to all our pupils who swam in the Edinburgh and Midlothian Schools Swimming Championships last Sunday winning 3 Gold and 4 Silver medals and recording several Personal Best times. 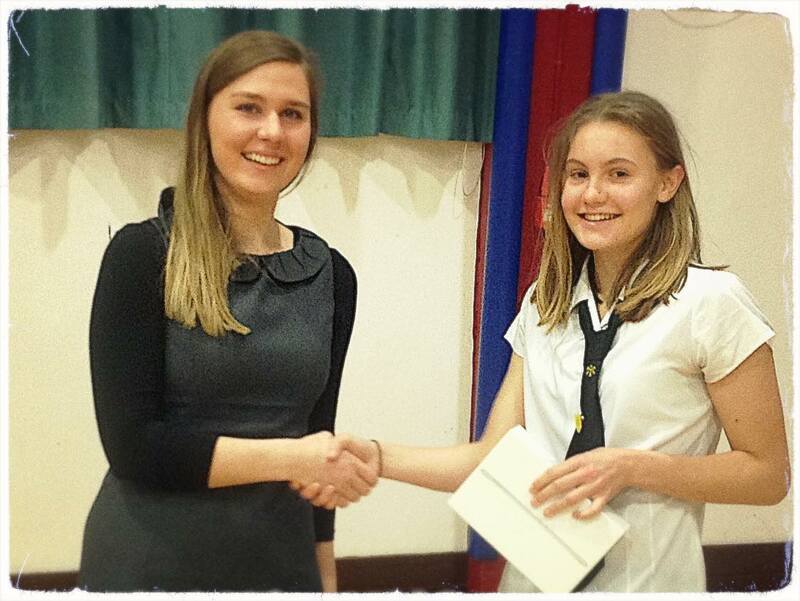 Congratulations to S4 Morven Stead who has won an award from the British Council in a writing competition on the subject ‘How international is your school and how International could it be?’ The photograph above shows Morven receiving her prize from Natasha Kozlowska from the British Council. 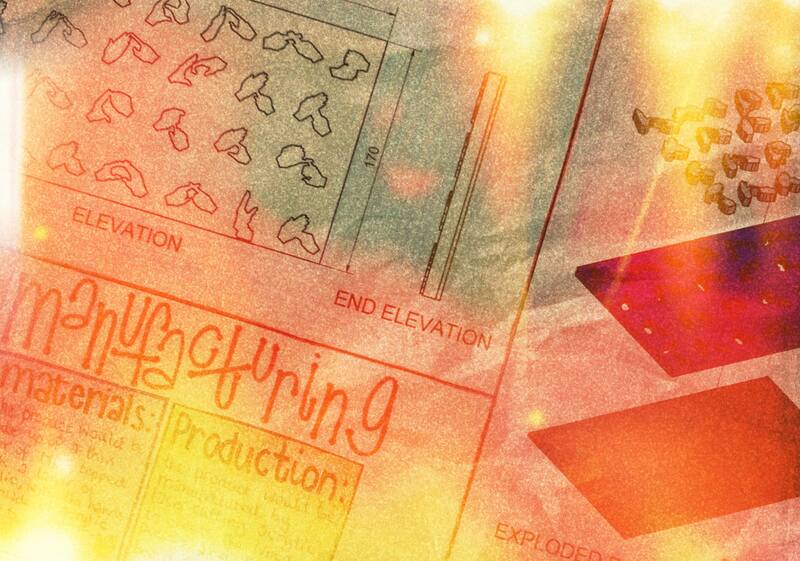 This essay was one of only three selected from schools throughout Scotland to win a prize. It was on a Duke of Edinburgh expedition recently, a seemingly compulsory activity for many a British teenager, and while huddled at the side of an East Lothian footpath, that I looked around and wondered where I would be as a person, if I didn’t have the companionship of my Polish friend, my Korean friend, or my French friend, all of whom were next to me. This invisible diversity, on such a quintessential British activity struck me as something quite precious. Many schools like to boast about their ‘global ties’, however, not every student can take advantage of these. Overseas trips are expensive. As are exchanges, with the added complication that many people are simply not able to host a stranger in their home for 5 nights. Despite the barriers – both physical and mental – of potential globetrotting with the school, coming into class everyday, and spending time with those of our peers, who weren’t born in Scotland, but whose families have chosen to live here, or are the children of first, second or even third generation immigrants, is what we have as the norm. Yet this diversity is what we fail to appreciate. Through casual conversations with our classmates and friends, through knowing themselves and their families, we subconsciously immerse ourselves in a different language; a different culture; a different outlook. Our traditional Scottish ways are enhanced and enriched – without us travelling anywhere. The world is in our classroom. By being in a school with people who unknowingly, have taught me about their culture, has increased my desire to travel, and has made me a more open, and accepting person. This is my school. And it should be every school. This ingrained diversity, transparent multiculturalism, adds a little je ne sais quoi to schools in Scotland. A Nat 4 and Nat 5 Assessment Overview is available in our downloads section It outlines the types of assessments for each subject at NAT 4 and NAT 5 level, with some giving specific dates. FESH are a group of S2 pupils with an interest in audio podcasting. Their aim is to bring you regular podcasts with news, features and interviews with a Trinity Academy viewpoint. Design Ventura top ten shortlisted schools for 2015 are…..
A team from Trinity Academy have made it though to the top ten shortlist for the 2015 Design Ventura competition. Design Ventura is the Design Museum’s award winning, national, design and enterprise competition. A live brief challenges young people to design a new product for the Design Museum Shop. This year they had had a record number of entries submitted for judging, The panel of shortlisting judges have selected the top entries from the 251 schools who registered to take part, the shortlisted schools will be invited to pitch their idea to a panel of judges at the Design Museum in early December. Congratulations to Dominika, Eleanor, Kirstin and Milly from S3 whose puzzle game (On The Other Hand), encouraging users to learn sign language, has made it to the shortlist. 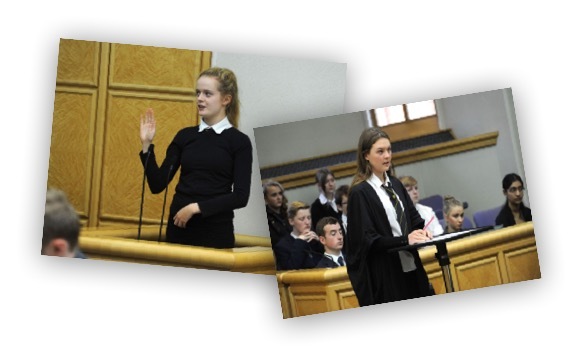 The MiniTrial event is an initiative from the Faculty of Advocates which allows pupils to play the roles of lawyers, witnesses, jurors and clerks of the court in front of a sheriff in a Scottish criminal jury trial. The role of sheriff is played by a member of the Faculty of Advocates. A school team from Trinity Academy took part in the event, which is held in October each year at the Sheriff Court and is supported by a defence lawyer and a procurator fiscal, who worked with the team. These expericiences are a great opportunity to learn more about how our courts actually function in real life. MiniTrials provide pupils with simulated court cases based on what actually happens in the Scottish Courts. During the trials, the students took part in a reconstruction of a criminal jury trial, where they convened the court, heard the evidence and then returned their own verdict. Young people, career starters and S4-S6 secondary school students are invited to a free Careers Fair on Friday 20 November 2015 in Edinburgh. This event will demonstrate how an interest in the past can open the door to a huge range of careers in heritage, such as education and outreach, archaeology, technology, maths and gaming. There’s a new blog post from the Rector on the school’s website.In this post he talks more about his vision for the school and the work being undertaken to increase our links with the cluster primary schools. The timetable for 2016 SQA exams is now available for download.